YouTube has provided support for uploading, hosting, streaming and playback of HD (High Definition) video clips for a while. Webmasters who want to embed YouTube videos on their websites have made use of YouTube higher quality video embed code trick and YouTube HD video embed code hack to present the high definition videos to their readers. Since then, YouTube has a new embeded player parameter switch that can enable HD playback by default, if available. Values: 0 or 1. Default is 0. Setting to 1 enables HD playback by default. This has no effect on the Chromeless Player. This also has no effect if an HD version of the video is not available. If you enable this option, keep in mind that users with a slower connection may have an sub-optimal experience unless they turn off HD. You should ensure your player is large enough to display the video in its native resolution. 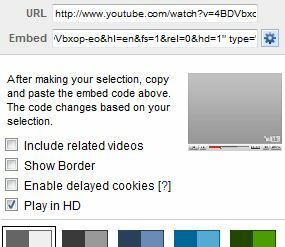 Actually, YouTube has provided an option on embedding code customization on HD-enabled videos that add in such parameter automatically. To enable YouTube hosted video to autoplay in HD mode when embedded on your web page, click on Customize button at the end of the embed code. If the video is uploaded in HD resolution, and support HD playback, there should be an option called Play in HD. Tick the check box for “Play in HD”, and then copy and paste the video embed code to your web page. If there is no “Play in HD” option, most likely the video does not have HD version of it. However, it’s still possible to try to force HD autoplay on embedded YouTube video, by amending the embed code manually. The hack is to add the following code to the end of the two URL web addresses point to the SWF Flash videos in the embed code. However, if the video is not up to HD standard, YouTube will probably not going to stream HD content even with the switch.